Russian earth resources radar satellite. Study 1992. The Arsenal Design Bureau proposed converting its military ocean reconnaissance spacecraft bus (EORSAT) into a civil remote sensing platform. Status: Study 1992. First Launch: 1994-08-02. Last Launch: 1994-08-02. Number: 1 . Gross mass: 6,500 kg (14,300 lb). 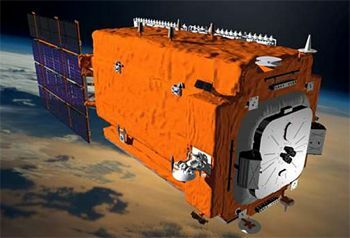 Called Obzor, the new spacecraft would feature a 4-channel model of the Travers SAR with a large antenna similar to the one proposed for Almaz 2. Developed by the Moscow Energy Institute, the radar would operate at wavelengths of 5.7, 9.2, 23.5, and 65 cm and would employ new processing and interpreting techniques created by the Institute for Space Geoinformation. The size and mass of Obzor would necessitate employing a Rus launch vehicle rather than the Tsyklon-2 used by EORSAT. Obzor would use a space-based radar to monitor the earth's resources, ecology, extraordinary situations and disasters. It would use the space platform developed for the third generation MKRTs developed by Arsenal. The Travers-A radar, built by OKB MEI (Moscow Energy Institute) used four frequencies and a polarized sounding signal. New methods of on-board signal interpretation developed by the Institute of Space Geoinformation of the Russian Academy of Science (IKGI-RAEN), Saint Petersburg, would pass only significant data to earth for further processing. An operational system would consist of three 6.5 metric ton satellites flying in 524 km orbits inclined at 81.4 degrees to the equator. A swath of 250 km would be observed with a resolution of 90 to 130 m, or a 50 km swath with a resolution of 6 to 12 m. The radar used four working frequencies and four polarized sounding signals. The spacecraft would have a three year life and require a Soyuz-2 launch vehicle. Obzor was based on the Arsenal mid-class spacecraft bus. This had a mass of 4000 kg and could accommodate instrument payloads of up to 3000 kg. The solar arrays provided 1 kW average power, 4 kW in full sunlight. The orientation system could position the spacecraft to within half a degree. The bus had a three year design life. Family: Earth, Earth resources radarsat. Country: Russia. Launch Vehicles: R-7, Soyuz M. Agency: Arsenal. Bibliography: 119.